Note: If I have not listed an important soft drink, please let me know in the comments section, and I will post a "Popular and Unique Soft Drinks From Around the World Part 2." A soft drink is a beverage that does not contain alcohol; generally it is also implied that the drink does not contain milk or other dairy products and that it is drunk cold. Carbonated soft drinks are commonly known as pop, soda pop, soda, cola, coke or tonic in various parts of the United States, pop in Canada, fizzy drinks, pop or soft drinks in the United Kingdom and Australia and sometimes minerals in Ireland. The adjective soft specifies a lack of alcohol by way of contrast to the term "hard drink". The word drink, while nominally neutral, sometimes carries connotations of alcoholic content. Beverages like colas, flavored water, sparkling water, iced tea, sweet tea, lemonade, squash, and fruit punch are among the most common types of soft drinks, while hot chocolate, hot tea, coffee, milk, tap water, juice and milkshakes do not fall into this classification. Many carbonated soft drinks are optionally available in versions sweetened with sugars or with non-caloric sweeteners. Almdudler is the brand name of a popular Austrian soft drink. The original Almdudler is a sweetened carbonated beverage flavored with herbs; its flavor is similar to ginger ale or elderflower cordial but with a somewhat stronger and more complex flavor. Almdudler has been called the "national drink of Austria". Its popularity in Austria is second only to Coca Cola; 80 million liters of the beverage are produced yearly. Appletiser was invented in 1966 by entrepreneur apple farmer Edmond Lombardi in the fruit-growing Elgin Valley of South Africa. Using a secret blend of six different varieties of apples balanced for flavor and smell, with a bit of carbonation, but no sweeteners or preservatives. Within three years of its introduction Appletiser was already being exported to other African countries, England and Asia. In its earliest years the company made distribution deals with Coca-Cola, which later purchased a 50% share of Appletiser in 1979. 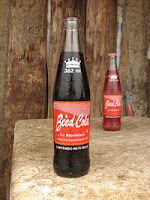 Beed Cola is a Peruvian range of soft drinks. Beed Cola is produced in Pucallpa, Peru and sold throughout the Ucayali Region. Beed Cola is sold in glass bottles of 362 ml. Beverly is a carbonated soft drink often consumed as a non-alcoholic apéritif made by the The Coca-Cola Company and sold in Italy. The drink's distinctive bitter flavor (sometimes described as grapefruit-like) is due to quinine. Quinine is also a key ingredient of tonic water, which is another soft drink noted for a bitter flavor. 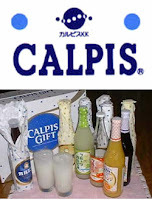 Calpis is a Japanese uncarbonated soft drink, manufactured by Calpis Co., Ltd., headquartered in Shibuya, Tokyo. The beverage has a light, somewhat milky, and slightly acidic flavor, similar to plain or vanilla-flavored yogurt or Yakult. It's ingredients include water, nonfat dry milk and lactic acid, and is produced by lactic acid fermentation. 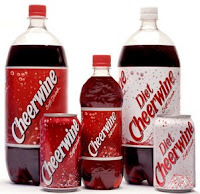 Cheerwine is a soft drink produced by the Carolina Beverage Corporation of Salisbury, North Carolina. It has been produced since 1917. Notable for its fairly unusual "cherry taste and rich burgundy color," Cheerwine has a very sweet cherry flavor and an unusually high degree of carbonation compared with many other soft drinks. Named for both its color and taste the company website explains that “it made sense to name a burgundy-red, bubbly, cherry concoction—Cheerwine." The "Retro Cheerwine" variant is sold in glass bottles and is sweetened with cane sugar instead of high-fructose corn syrup. Cola Lacaye is a Haitian soft drink founded by Rigobert Richardson in 1977. Today, Cola Lacaye soda is manufactured and distributed by The Brooklyn Bottling Group, which manufactures, distributes, imports various Caribbean-based soft drinks and food. Cola Lacaye comes in three island flavors; Fruit Cola, Fruit Champagne and Banana. Cola Lacaye has become part of the Haitian American cultural dining experience. 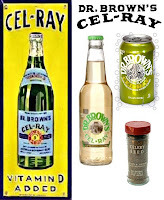 Dr Brown's Cel-Ray soda is a soft drink with a celery flavor. It is fairly easy to find in New York City and in South Florida. Outside the New York City region, it is rather obscure but can sometimes be found at Jewish delicatessens and restaurants. In addition, it can be found at certain grocers that specialize in American food in Israel, and other specialty grocers. The flavor is reminiscent of ginger ale, but with a more pronounced celery flavor that is more pungent or peppery, derived from celery seed extract. 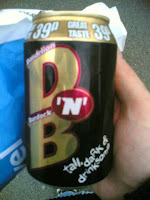 Dandelion and burdock is a traditional British soft drink, drunk in the British Isles since about 1265. Traditionally it is made from fermented dandelion and burdock (Arctium lappa) roots, and is naturally fizzy. Guaraná Jesus is a Brazilian soft drink produced by bv0, a Coca-Cola bottler based in São Luís. The drink is popular within the region, reportedly outselling Coca-Cola, and is made from extracts of the guarana plant, which contains caffeine, theophylline, and theobromine. Lago has noted that "Every Brazilian knows that guarana is a stimulant and that means it stimulates everything". The drink is named for Jesus Norberto Gomes, the druggist who formulated the drink in 1920. 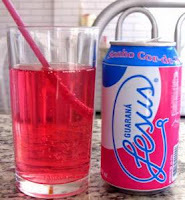 The drink has a pink color, a cinnamon aroma and a very sweet taste, and is marketed with the slogan "the pink dream". The drink is now a brand owned by the Coca-Cola Company. Irn-Bru (pronounced iron brew) is a popular carbonated soft drink produced in Scotland where it has been made by A.G. Barr, of Glasgow for more than a century. In addition to being sold throughout the United Kingdom, Barr's Irn-Bru is also available in many key markets throughout the world and can usually be purchased where there is a significant community of people from its native Scotland. Innovative and sometimes controversial marketing campaigns have consistently kept it as one of the best-selling soft drinks in Scotland where it competes directly with massive global brands such as Coca-Cola and Pepsi. 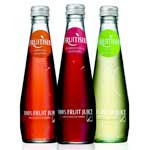 Like most leading soft drink brands, the product range has gradually been extended from the original drink to include "high energy" and low calorie versions. Ironport is an old-fashioned carbonated soft drink from the early part of the 20th century that was served at soda fountains. It can still be found in parts of Utah, Southern Idaho, Western Wyoming, and Eastern Nevada. The flavor has been described as somewhat of a cross between root beer and Caribbean spices and is very similar to the Cuban soda pop, Iron Beer. It is rumored to have been named after Porter Rockwell. Julmust is a soft drink that is consumed mainly in Sweden and Norway around Christmas. 45 million litres of julmust are consumed during December (to be compared with roughly 9 million Swedes), which is around 50% of the total soft drink volume in December and 75% of the total yearly must sales. Must is made of carbonated water, sugar, hop extract, malt extract, spices, caramel colouring, citric acid, and preservatives. The hops and malt extracts give the must a somewhat beer-like taste, but much sweeter and, since it is not fermented, it contains no alcohol. It can be aged provided it is stored in a glass bottle. Some people buy must in December only to store it a year before drinking it. 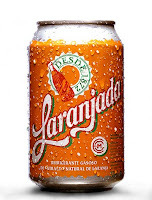 Laranjada is a type of carbonated soft drink with an orange flavour, which is sold in Bars, Restaurants & supermarkets all over the island of Madeira. It is produced and distributed by the Empresa de Cervejas da Madeira, which is owned by the Pestana Group. Laranjada is 14 years older than the original and now famous Coca-Cola drink. Milkis is a soft drink produced by Lotte Chilsung, a Korean beverage company. It combines many of the common elements of traditional carbonated beverages such as corn syrup, sugar, and carbonated water with milk to create a creamy taste; its label proclaims "New feeling of soda beverage". In Russia, Milkis is available in orange, strawberry, mango, muskmelon and classic (regular) flavors. It was a highly popular drink in the early 1990s. Since then, its popularity has declined but it remains widely available. "We want consumers to be more familiar with cheese, so we’ve made a liquid version that makes it more accessible. It’s also good as a salad dressing." Pakola is a line of fruit flavored soft drinks, originally introduced in Pakistan in 1950 by Haji Ali Muhammad. It is produced by Mehran Bottlers (Pvt) Ltd. It is the first nationally branded soft drink of Pakistan. Hence its name Pakola meaning 'Cola of Pakistan.' 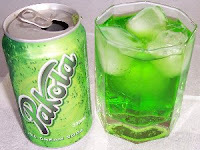 The original green color Pakola ice cream soda is still popular in Pakistan. However, other Pakola flavours, like Pakola Lychee, have gained popularity. Another famous type of Pakola is Pakola Orange, which is an orange soda with an ice cream taste. Passiona is a passion fruit-flavoured soft drink available only in Australia and manufactured by Cadbury plc. The flavor of Pepsi White is lighter than tradition Pepsi. 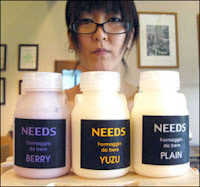 Japan marketing News reports that it has a sweeter, yogurt sort of flavor. 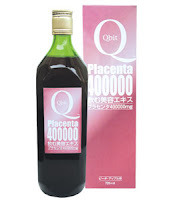 From Nihon Shokuten's line of placenta products, comes this drink made of swine placenta. All in the name of beauty. Despite the unique design of the bottle, the Ramune flavour is quite conventional, similar to many other carbonated lemon-lime soft drinks. The word 'ramune' is derived phonetically from the English 'lemonade'. Both fizzy lemonade and the unique bottles were imported from the United Kingdom at the same time, becoming associated with each other. 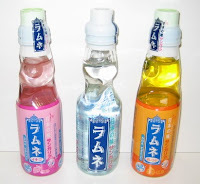 In America, Ramune is often sold at conventions, certain Suncoast outlets, Borders, BevMo!, and Asian speciality stores. The modern formulation in Pakistan is less complex. Rooh Afza is said to be a great alternative for chocolate milk. It is often mixed with milk and ice. Sometimes people make it with ice cream, 7up, and Coke. 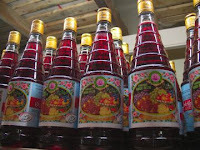 Rooh Afza is traditionally made in preparation for breaking the fast during Ramadan the holy month of fasting for Muslims. It's most commonly used to make a refreshing drink, just by adding water and sugar. 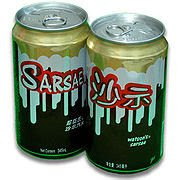 Sarsi is a sarsaparilla-based soft drink sold in Australia, the Philippines and other Southeast Asian countries. 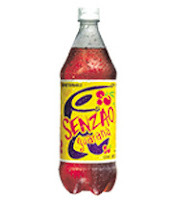 Made with guaraná, a fruit that grows only in Brazil, SENZAO is a carbonated soft drink with the spirit of Carnivál and the sensuality of the Brazilian people. Available in Mexico, Norway and Sweden. Soda sữa hột gà, also known as egg soda, is a sweet drink made from egg yolk, sweetened condensed milk, and club soda. The beverage is of Vietnamese origin, though it is also consumed in Cambodia. Garlic, which served as a source of strength to build the ancient Egyptian pyramids, contains allicin with protein and allinase as an enzyme to decompose alliyn. Since it makes nutritious elements alive and gets rid of a disgusting smell, it is good for people`s health. Tamlamaneul Saem was designated a traditional food drink by the Ministry of Agriculture and Forestry in 1997. The raw material to make this drink is extracted from garlic and then concentrated. Ting is a carbonated beverage popular in the Caribbean. It is flavored with St. Kitt's or Jamaican grapefruit juice (from concentrate), and is both tart and sweet. Ting comes in a green glass bottle, or more rarely in a green and yellow can. Like Orangina, the beverage contains a small amount of sediment consisting of grapefruit juice pulp. Ting is produced under license by Cott Beverages. A canned drink called "Unagi Nobori," or "Surging Eel," made by Japan Tobacco Inc., hit the nation's stores this month just ahead of Japan's annual eel-eating season, company spokesman Kazunori Hayashi said Monday. "It's mainly for men who are exhausted by the summer's heat," Hayashi said of the beverage, believed to be the first mass-produced eel drink in Japan. Many Japanese believe eating eel boosts stamina in hot weather. 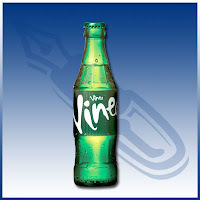 Vinea is a carbonated grape-based soft drink invented in Czechoslovakia in the 1973 by Slovak Ján Farkaš, a biochemist working for the Research Institute for Viticulture and Wine-making in Bratislava. The production begin in the 1974. After years of trademark ownership disputes, Vinea was sold to Kofola in January 2008. It is particularly popular in Iran and parts of the Arab World, having gained a cult status there as a Muslim alternative to "Western" products such as Coca-Cola and Pepsi. Zam Zam is also one of the few remaining soda companies in Iran that uses refilled glass bottles. Any such list that doesn't include Faygo is automatically invalid. Hey isn't Pepsi White the same Crystal Pepsi everybody fell for back in the 90's? Only in Japan. Check out Kvass, fermented/naturally carbonated rye drink, which is popular in Russia and Eastern Europe. I've tried this in Ukraine which is sold either bottled or out of street carts in markets (latter is this is the best, most tasty). Definitely unique to the region and another is Malta from the Caribbean, a sweet malt drink which has not been converted to alcohol. Enjoyable post, got here from Neatorama. Happy to see Cheerwine on here! Don't even bother with the canned or plastic bottle varieties. It's like drinking straight-up syrup. As I recall, the glass bottle variety not only uses cane sugar instead of corn syrup, the actual recipe is also slightly different. 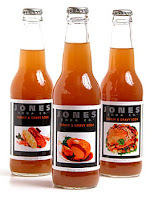 By the way, don't be turned off by Jones' weird holiday flavors. Their year-round flavors are actually very delicious, FuFu Berry and Berry Lemonade being my personal favorites. Their Root Beer, though? Not so good. Was disappointed not to see Virgil's Root Beer on here, but I guess they can't all be American. I've seen Cel-Ray at the central Florida deli chain "Too Jays", for those interested, but have yet to try it for myself. My bad, Virgil's was originally produced in the U.K., now manufactured in the U.S. So not really sure where to put it. I can think of four to add to the part 2 list. Rivella -- Swiss soft drink produced from milk plasma, and therefore includes ingredients such as lactose, lactic acid and minerals; it doesn't taste like milk at all and it's good! Moxie should be on this list. definitely. Oh my goodness! I'm from Salisbury. So if you try cheerwine you HAVE to try it ice cold. Icy ice cold. Actually the best thing to do is try it in the form of an icee. Or else it's a hot mess of not very good. you've been had. 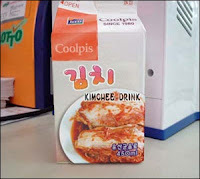 coolpis kimchi drink is a FAKE. it's been debunked, what, almost two years ago. do some real research. I started going through this list hoping to find some info on both Goombay Punch and Junkanoo from the Bahamas (I think there was a Pepsi bottling facility there) Can you get it anywhere else? how about POP COLA from the Philippines????? New Zealand has its own softdrink which is hugely popular and extremely sentimental to kiwis. This is called Lemon & Paeroa (Almost always referred to as L&P) is a unique lemonade with a really different and delicious taste. It's made from the spring water from the small town of Paeroa, hence its name. Now owned by the Coca Cola company but its wikipedia page... http://en.wikipedia.org/wiki/Lemon_%26_Paeroa. I'll second the request for Kolashampan - truly the unique flavor of El Salvador. A great list. I'm not gonna criticize because you did a way better job than I would have done, but I gotta show some love for Italy's Sanbitter, a virgin Campari soda. Mexico is a soda mecca too if you ask me. Kinnie is Malta's national non alcoholic beverage. It is made from an extract of bitter oranges and herbs similar to those used for vermouth. The taste is bitter with a sweet aftertaste. Color is brown. Developed more than 50 years ago by the local beer brewer Farson's. Heh.. Fun to see the "Julmust" listed. Here in Norway it's called "Julebrus", though. It tastes great, and I always look forward to drinking it in December. Something similar is sold the rest of the year as well, under the name "Eventyrbrus", but it honestly doesn't taste good when it isn't Christmas! milkis is a cheap rip off of calpis. Please include "Ting," a grapefruit soda from D&G in Jamaica and the same company's "Ginger Beer" (made with cane sugar -- delicious). India's Coca Cola knockoff is "Thums Up" and features the great slogan of "Taste the Thunder." There's also Limca, a lime soda. Both are Coca Cola owned now, sadly. In Ghana, I came across a soda called Pee Cola. Ale 8 1 (A late one) from eastern Kentucky. Ther eis practically a cult for this Mtn. Dew on steroids. "Bionade", a relatively new but pretty successful, organic lemonade from fermented malt. Tasty. "Afri Cola" is an old cola beverage which was espacially big in the late 60ies. Nice bottles too. And better-tasting than Coke or Pepsi. "Capri Sonne" (Capri Sun) is a sweet juice drink known for being sold only in silver plastic pouches. Turns out that Appletizer also makes Grapetizer (in red and white versions) and Peartizer (variations on a theme, as it were). *From Australia: Bundaberg Ginger Beer, Lemon-Lime Bitters and Horehound Beer. *From South Africa: Stoney Ginger Beer and Schewppes Bitter Lemon Soda (with Wonder-Working Quinine). *From the United States: Spring Grove Soda (popular around extreme southeastern Minnesota and northeastern Iowa), Moxie, Vernor's Ginger Ale, Faygo Rock & Rye, Reed's Ginger Beer and the several varieties offered by the Sprecher Brewery in Milwaukee (among them root beer, honey cream soda, ginger beer and cola). What? No Pocari Sweat from Japan? Very difficult to list all (or even most) of the unique soft drinks around the world. Nice list, though. Cool to see a lot of drinks I never heard of. VERY GLAD to see Cheerwine made the cut. Amazing drink...I live in NC and it is very popular and most everyone I know likes it. Definitely my favorite. Glass bottles are the best, by far. I also agree with a previous poster that Vernor's Ginger Ale (I heard it was the first) is a good selection, as well as 'Good Old' Blenheim Ginger Ale. HEY I'VE GOT SODA YOU SHOULD INCLUDE! IT'S CALLED PINEAPPLE CRUSH, IT'S FROM THE VARIOUS CRUSH VARIETIES PEPSI MAKES, BUT IT'S ONLY AVAILABLE HERE IN NEWFOUNDLAND, THE MOST EASTERLY PROVINCE OF CANADA, WHICH ALSO HAPPENS TO BE AN ISLAND. IT IS A VERY DISTINCT COLA IN THAT IT IS EXCEPTIONALLY FIZZY AND SWEET. YOU REALLY HAVE TO TRY IT, IT MAKES THE BEST ICE CREAM FLOATS! Have you tried Aloe Morning from HAITAI in Korea? It is made from the the Aloe plant and has real Aloe pulp and has a sweet grapey texture and taste to the drink. Real Good. My favorite is Derr's Strawberry Soda, it has been around since 1889. The website address is http://www.derrs.com . It is the best strawberry soda that is on the market today! I did not see Ginseng Up listed - a Caribbean drink that is my all time favourite soda pop. you should add Djino because its so amazing!!! You know, you oblige a legitimate storage room framework to keep up your collection of wines.I bought this wine bottle chiller on perusing through the determination inside of the depiction. You will discover many brands, advertise their models by different names.By reading Wine Cooler Reviews you can know a lot about this.